I’ve been reading a book brought to my attention by Penman (you might want to add some thoughts of your own, if you’re around, P), called Adam’s Ancestors by David N Livingstone. It’s a history of the various theories about pre-adamic man since the idea was first suggested by Isaac La Peyrère in the 17th century, which if it seems esoteric, is. It was of interest to me in general because of modern attempts to retain a historical Adam in an evolutionary scheme, on which I thought it might cast some light. In the event it has only minor relevance to that issue, and has served for me more like one of those books you buy on a whim at the railway station bookshop, teaching you stuff you’d never have thought to study deliberately. So I’m not suggesting you go out and buy it. But in fact, pre-adamism had a tangential influence on all kinds of different areas, and because the book’s focus is not on the mainstream, it gives a very good picture of the general intellectual climate of the relevant times, and particularly the nineteenth century. What strikes me most overall is that, in relation to the interface between science and theology, the debate then was pretty much identical to the debate now. A large number of the contentious issues now were just as contentious then, and seem urgent only because we’ve forgotten they have been tossed around endlessly since Darwin, and even long before. Indeed, one can see in the writings of the protagonists then, and their opponents’ replies, exactly the same attitudes, both good and bad, that we encounter now. Atheist scientists then were still accusing Christians of being obscurantist in the light of the firm findings of science just as much as the Jerry Coynes of this world do now – with the difference that with the benefit of hindsight we know that those firm findings have proved completely mistaken. Which raises the question of why we should have any more confidence in what is “firmly founded” now, other than a blind belief that then=bad, but now=good. At the same time theologians were making both good and bad use of Scripture and science both, with the passage of time once more bringing both into relief. Time makes fools of all of us. On the fringes – or even sometimes in the mainstream – were the completely kooky ideas that somehow, at the time, seemed persuasive to many people because of the prevalent worldview. The net result of this is to confirm my suspicion that the tide of progress is often really just a recycling of confusion. People tell us that there is now a broad consensus on the science, and clear trends in theology, but close examination rather suggests a multiplicity of incompatible views, in varying combinations, both within and outside the academic community. This pot-pourri of ideas also shows that the modern meta-narrative of the world’s being turned upside-down and set in a new direction by Origin of Species is a convenient lie. At the time Darwin seems to have been just one voice, though an important one, in a whole swirl of conflicting ideas influencing society. Just like now, in fact. L et me give just one case as an example of this plus ça change plus c’est la même chose observation. Livingstone cites Sir Ambrose Fleming (1849-45), who was without doubt a respectable scientist and engineer, and finally a member of the Royal Society. 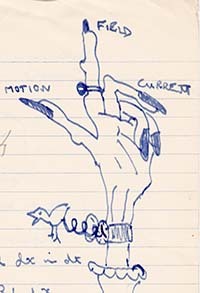 At school we learned his Left Hand Rule in physics (as evidenced by this illustration from the whimsical set of A-level notes bequeathed to me by my friend Murray before he too became an electronic engineer). Fleming also invented the thermionic valve, without which my Marshall guitar amplifier would be very silent. His academic credentials were impeccable. Before the age of information theory or Philip Johnson, it is hard to think of a clearer statement of Intelligent Design, so no doubt he would be an Intelligent Design Creationist in any modern opponent’s book. Yet like some TEs today, he saw Darwin’s own stance as sympathetic to theism, and the Neo-darwinians of his own day as untrue to their mentor. Incidentally, the same uncertainty over Darwin’s true position was as much the case in the nineteenth century. Like some conservative TEs today, he saw God’s intervention as necessary at three key points – the origins of matter, life and mankind, and argued from science and Scripture for these in opposition to what the Daily Telegraph called “the central modern scientific doctrine.” Fleming invoked pre-adamic man to account for Neanderthals and any other legitimate hominid remains, as R J Berry does today only with more allowance for evolution. Paradoxically (by todays’s standards) part of his case was the division of modern man into several species of which the Caucasians were, naturally, spiritually superior (I’ll try and do a separate post about the interesting case of scientific and theologically based racism soon). He displayed an almost Southern-states aversion to inter-racial marriage, blaming it for the Great Flood. Opposition to Fleming came in 1935 from anatomist Arthur Keith, who at least did not, as tends to happen nowadays, insist that Fleming’s Creationism disqualified him as a scientist. He did, however, complain that special creation was “impossible” (though note that Fleming’s three “creation points” hardly denied the reality of change over time through secondary causes). Though not, apparently, a believer, Keith felt qualified to argue against him from the Bible itself. It’s also interesting that Keith, the anatomist and anthropologist, was a staunch supporter of Piltdown Man, later shown to be a crude hoax. Another scientist critic accused Fleming of bringing metaphysical considerations into science, which a working scientist should not do – anothert complaint with a modern ring to it. I’m pleased to say that at least one Christian reviewer of Fleming took him to task for compromising the unity of the human race by his white supremacist tone – it is fairly significant, I think, that this critique did not come from the scientists. Overall though, it appears to me that the case of Ambrose Fleming shows that apart from details of the scientific evidence and shifts in the general spirit of the age, very little has changed in the science-faith debate over the last 80 years. Fleming’s arguments, and those of his opponents, are virtually as good (or bad) now as in 1930. Time certainly hasn’t shown him up as an IDiot charlatan purveying pseudoscience, even if it hasn’t vindicated all he said. And sadly I think that whether, in another 80 years, he is regarded as a backward looking fossil or a forward looking pioneer will depend more on the 22nd century zeitgeist than the actual strength of the arguments. Don’t forget that in addition to his achievements in engineering, Fleming was a master of theoretical physics. He anticipated by over a hundred years the discovery that certain subatomic particles can travel backwards in time. He also, like a good engineer, made a practical application of that discovery to human life: born in 1849, he died in 1845. A great man, with flaws … what is both hard to say and a subjective judgement is what his greatness was, and which his flaws. He exemplifies the futility of trying to bundle ideas up into Movements and Organisations – real people straddle the boundaries, as the whole of “Adam’s Ancestors” shows. A lesson for today. The most you can look at is popular trends, and of course the merits of the ideas themselves, distinguished from the baggage associated with individuals. Fleming’s own EPM started as an academic, predominantly science-based organisation with a “directed TE” stance, for all its anti-Darwinism. But later, after Fleming’s generation had passed, it became one man’s domain and wedded to Creation Science and the accompanying style of biblical literalism. Any labels that don’t take those kind of changes and complications into account are pretty misleading. Sorry, James, I ignored your spotting of my typo altogether. And arrived back the previous night. Yes, I’m still here. Hello Jon & James! I have nothing to add on the book itself – I’m a confirmed fan of Livingstone, all of whose historical writings I’ve found outstanding. On the general point: for me, the key issue is not so much asking whether a scientific view is true (most people lack the expertise to settle that honestly) but whether it’s compatible with scripture. It helps to decide where we should draw lines, not about the truth of this or that scientific theory, but concerning our churchly fidelity to scripture. For example, if some scientific theory were to assert materialism & deny the existence of the human soul or angels or God, we would draw a line – it’s incompatible with scripture. I don’t think such incompatibility applies either to the General Theory of Evolution (descent with modification over geological time) or the Special Theory (genetic mutation plus natural selection). As it happens, I’m sceptical about the latter as a sufficient explanation for change, but not on scriptural grounds. My problems with evolutionary scientists are almost always their theology. You know the kind of thing. From atheists, arguments from “bad design” to the non-existence of God. From theists, the woeful stuff about freedom, process theology, etc. And the mythologizing of Adam, my pet hate. I suppose what I found most fascinating was the confidence of scientists (and to some extent biblical interpreters) in making bold new claims based on “what we now know”. So familiar. In some cases the same claims are being made and we still don’t actually know (though the claimants are still saying we do); and in some cases the claims are made in the same strident terms now, only the previous firm knoweldege has been overturned sometimes by science, or just as often by fashion. Lest I appear to sideline the bookj itself, though, the examination of the history of pre-adamism is illuminating and valuable. I guess I am not on-topic again – I agree the starting point is scripture. The general outlook commences with one’s position  do we believe in God, or do we adopt the non-belief that is atheism. If the latter, a view that includes purposeless, blind chance, with the Sciences bringing something that can sustain this outlook, is inevitable. If the former, then Scripture must be the authoritative source of our faith, which also imposes on us the obligation to seek what is true. I take this to also obligate us to insist on the truth of anything we discuss, which also means a determination not to adopt things that may sound ok but in fact are a mixture, or mishmash, of speculation, wishful thinking, and at times regurgitated nonsense re-dressed to make it appealing. I find it intolerable that people who should know the difference between speculative scientific activities and what science considers proven (or certain within the limits of the scientific method) will assume they have been invested with the authority of the sciences, and they can decide on what is correct science, and even decide who is and is not a scientist. Outside of religious discussions, such an outlook is regarded as nutty and thus ignored  within discussions in forums such as BioLogos (and other sites I have briefly visited recently), this nonsense seems to be their stock-and-trade. I think it is unfortunate that creationists, TEs, IDs, etc., have taken a view that faith must somehow be supported by any scientific fad that has taken the fancy of itchy ears. Little to disagree with there GD. The book threw into relief, though, why it’s necessary to grapple with these issues. Once the debate started in the 19th century (or before), arguments from “science falsely so called” or from twisting Scripture were more than intellectual/religious hot air. On the faith side, the persuasive hard sell of materialist metaphysics as “assured science” led to the undermining of trust in the Bible both in society and in the seminaries. But more widely, such arguments were used to justify enslavement, the literal dehumanisation of other races, colonial expansion and warfare etc. The one thing that, paradoxically, seems to have been better understood in those days is that there was a clash of two worldviews, both of which had the right to exist. There seems to have been less of a widespread tendency to ridicule destroy academics on the grounds that they believed in God, for example. Though some liberalising theologians were sacked from conservative seminaries and vice versa. This reminds me that I always liked the 19th and early 20th century debates on these because, while there was an obsession with progress, it was only the tipping point. Many were on their toes, willing to listen to ideas, looking forward. They believed they had just entered a new era of “Science”. Atheist, Agnostic, Theosophist and Christian alike. Now a days, the debates have a fossilized orthodoxy and just come off as much more cranky. Unlike those before, there’s a sense that we’ve arrived and not merely on the right road (not that it’s the right road, but perception anyhow). The wonder is gone, all that’s left is to finish building the walls. How sad! That’s a good last point, Cal. reminds me of that famous pre-relativity, pre-quantum pronouncement that physics just needed tidying up to be complete. In fact, though, there is a huge amount of mystery left, from Information Theory, through epigenetics to Rupert Sheldrake. It just seems that our generation has got really good at insulating itself from the anomalies. Perhaps that always happens before a paradigm shift. Christological creation – 5: What is man?